How can design provoke agency, accountability, and collaboration within educational systems? Instruments of Empowerment is a systems-level response to challenge the status quo and educational inequities through a redesigned student report card that shares a more dynamic and holistic narrative of a student’s progress. The goal of the instrument, and the dialogues provoked, is to redraw communication and accountability lines, activate collaboration, and empower educators and parents to support students. 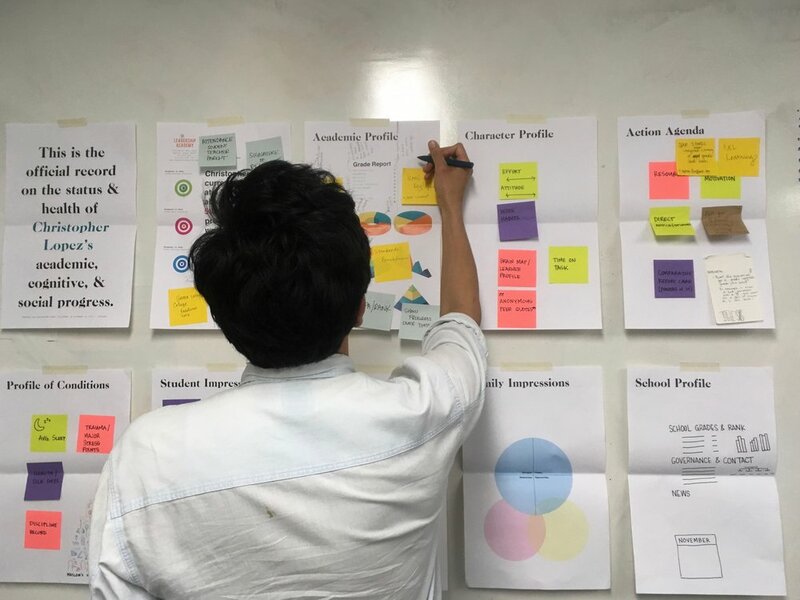 This transdisciplinary design aims to reinvent the content, visual aesthetics, and goals of current student report cards in order to offer alternative tools and approaches that can generate the conditions necessary for creating equity, accountability, and empowerment across our education systems. In 2016, the U.S. DOE reported a record national high school graduation rate of 83.2%. However, even with a record completion rate, only a third of graduates are considered prepared for college, based on recent NAEP data. Simultaneously, many schools and their students are also challenged by legacies of poverty and racism. Research suggests that education can be the single most important tool for creating social mobility and eradicating poverty. However, the overwhelming inequalities, inefficiencies, and injustices within our education system have created a complicated network of processes that do not guarantee students a fair or successful learning experience. Studies prove that student achievement and potential increases with parent involvement and engagement. When students and their families are equipped with balanced and holistic student performance information, they are more capable of staying engaged and have more agency to play an active role in a student’s success. Their collaboration can make all the difference, even in the face of injustices. 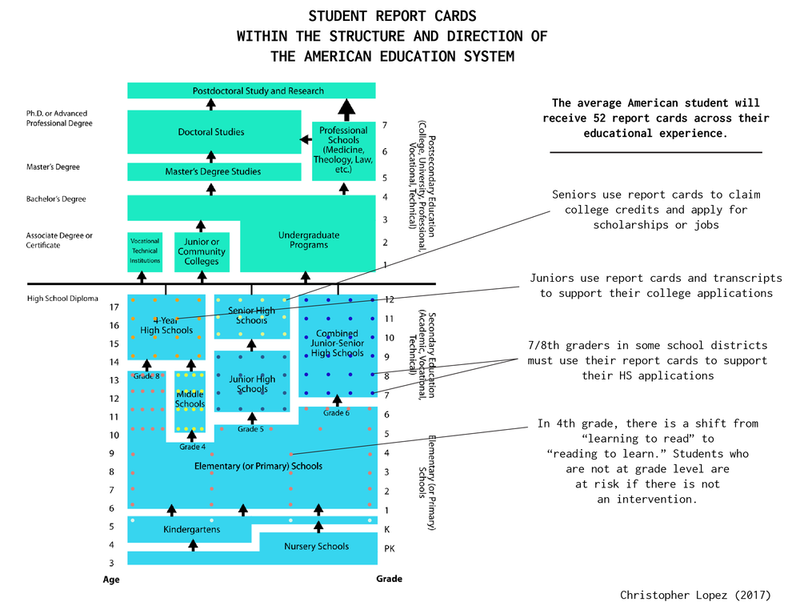 For decades, school systems have used report cards as communication artifacts that share the achievement of students. Unfortunately, the majority of these documents use unclear evaluation systems and lack opportunities for parent and student agency. However, the widespread use and familiarity of the artifact positions the tool as a prime vehicle for design to intervene and propose an alternative instrument. By engaging a variety of stakeholders and users, the project was able to shift and take a shape that responded to the differing needs and perspectives of parents, teachers, and students. This level of user engagement and participation was critical to the development of the project and its success. The project was further developed through extensive primary and secondary research, participatory design methods, systems-thinking tools, and visual communication design and software. Prototypes were tested with a large and diverse group of students, teachers, school administrators, education professionals, and designers. Their stories, needs, and ideas helped create a more dynamic product that has earned positive user feedback and various accolades. Through this redesigned artifact, students are more informed and clear about their actual performance and growth, allowing them to be active agents of their own progress. Parents are more aware about their student’s progress and are more able to play an active role in their student’s learning and development. They are also better positioned to be activists for change because of increased transparency. Current teachers are given a stronger instrument to encourage and increase parent:teacher collaboration, which complements their teaching and helps support student learning, in and out of school. Future teachers have more holistic data to customize their approach to incoming students. The potential of this redesigned artifact as an Instrument of Empowerment can create new opportunities for intervention, accountability, and opportunity within educational ecosystems. It may also help shift the educational outcomes of students in underprivileged communities by generating new energy and activism for equity and social-justice. To learn more about this project or to access the full prototypes, please email me.